I read the Kindle version of this book. I find that when I do that, my reading can get interrupted by several days or even weeks (because I’m also reading one or two other books on the same device). 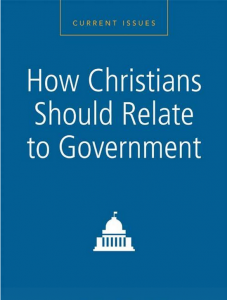 For the most part I enjoyed Grudem’s thoughts and points on Christian involvement in government. I especially liked his rebuttal of Gregory Boyd’s view of total Christian pacifism in the book The Myth of a Christian Nation. However, when Grudem argues for Christian participation in governmental changes and in social changes, and takes great issue with John MacArthur (Why Government Can’t Save You), I find myself agreeing more with MacArthur, at least with the statements from him that Grudem uses. Grudem is saying that the church must influence government and culture or it will fall apart. MacArthur is saying that the church must not leave its gospel calling and be distracted with civil and social causes, or the church will fall apart. I think their disagreement stems from Grudem referring to the “church” as the universal church, or Christians at large, living in any particular society. MacArthur, on the other hand, seems to be referring to the local church and its particular calling. I would say, and I think MacArthur is saying, that the local church must keep its priority of the Great Commission or its members will never be able to go out into society and be productive citizens. If it gets distracted from that (which is a huge problem these days) the church will cease to be the (local) church and society will suffer from not having Christian citizens who are thoroughly discipled in their faith and values. Grudem, on the other hand, mixes the universal and local church concepts so much that the reader can’t tell to which he refers. Consequently he argues for Christians being good salt and light in society, but (since they are part of the “universal” church) he ends up saying that the church (now he seems to mean “local”) must continue to be involved in civil and social causes.